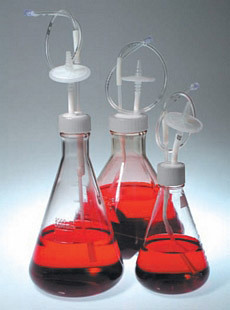 Bio-Simplex™ Erlenmeyer flask systems — the number one choice of the biopharmaceutical industry for single-use assemblies — feature a standard polycarbonate flask, cap and EZ Top® Closure Assembly; the latter is now available as a stand-alone item. These assemblies are made from C-Flex® pharmaceutical grade thermoplastic elastomer (TPE) resin and consist of tubing with choice of either Luer connections or CPC quick disconnect end fittings, a Bio-Simplex™ Flex Joint™, a 0.2 µM vent filter (for sterile gas exchange), and a polypropylene cap. They are engineered to ensure an unobstructed fluid path, extremely low levels of extractables, and a secure elastomeric seal against plastic, glass and metal surfaces. Customer-generated designs, sizes, packaging and other options — such as connectors, heat-sealed ends or alternate flask materials — are available on request. Bio-Simplex™, EZ Top®, C-Flex® and FlexJoint™ are trademarks of Saint-Gobain Performance Plastics.